Eating a Mexican breakfast is probably one of my favorite meals of the day. You can go with something sweet and simple like pan dulce or something spicy and savory like Machaca con Huevos. The latter dish is a mixture of dried shredded beef, eggs, onions, tomatoes and chile peppers. In Mexico, there are a number of breakfast foods that reign supreme and machaca con huevos is on the top of the list. Other savory breakfast meals are red or green chilaquiles, huevos divorciados, chorizo con huevos, or chorizo con papas. The machaca con huevo is hearty enough to keep you satisfied until lunch time. This is a traditional dish in the northern state of Nuevo León, Mexico. Maybe it is the combination of eggs with the dry meat that people really enjoy having it for breakfast with warm flour tortillas. But honestly, you can eat this meal for lunch or dinner. 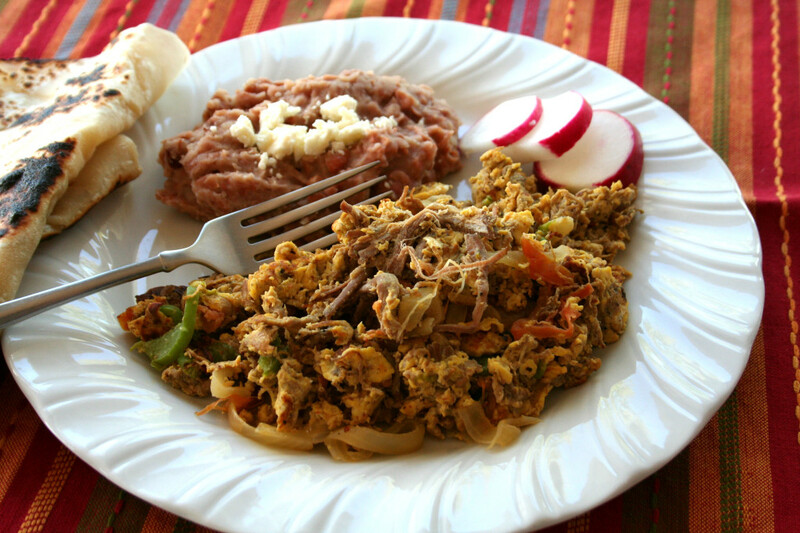 Machaca can be found in the Hispanic section of large supermarkets or in Mexican grocery stores. Making the machaca itself is a three-part process. Using skirt steak, first you slow braise in tomatoes, onions and garlic until meltingly soft. Then you shred and dry the meat into chewy strands. Originally the sun did the drying, but nowadays an oven on a low temperature does the job wonderfully. Machaca is something you can make in big batches and then refrigerate or freeze for later use. Once the beef has been cooked and dried, you shred the meat finely. The dried beef, or carne seco, has just the right touch of saltiness – and the chewiness of the beef is the perfect foil for the tender scrambled eggs. It’s rich and super-satisfying. In a medium-sized bowl, scramble the eggs with the milk and set aside. In a large frying skillet over medium high heat, sauté the onions until translucent, about three minutes. Add the garlic and green bell peppers and Serrano chile and stir for another two minutes. Add the beef and allow the meat to get warm and mix in with all the other ingredients. Add the scrambled eggs and mix well. Salt and pepper to taste. Serve with refried beans and warm flour tortillas.